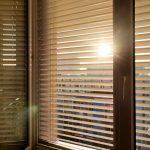 With the many modern blind options now available, from venetian to translucent blinds, and roller blinds to vertical drapes, choosing the right blinds these days can be a tricky decision. But evidence is showing that installing new, and well suited blinds can score you a higher sale price when putting your property on the market in Melbourne, Victoria. What used to be overlooked as a mere standard feature, blind and window furnishings are now being seen as a value adder in the Melbourne property market. These days, property buyers are looking for style, aesthetically pleasing finishes and practical functionality when purchasing a home. Although the choices are endless, the main things to consider when installing blind to enhance your property, are that your blind helps to create the right vibe and offer the perfect amount of privacy and light for the aspect of the room. In apartments throughout Victoria, especially Melbourne, wet areas like bathrooms, laundries and kitchens are seeing a trend in plantation shutters, especially in neutral tones. These neat looking, and easy to clean blinds are very aesthetically appealing and provide a modern and peaceful feeling. Practically, residents are favouring this type of blind as they can control the amount of privacy and light which enters the room. Lately, new townhouses and home sites are featuring some of the more advanced blind options such as dual roller blinds and motorised blinds. These type of blinds compliment state-of-the-art living, dining and entertaining zones very well and help to create an ultra-modern feeling. Now more than ever, you will read about feature blinds in property sales marketing campaigns, and the photography used to promote a home often uses the drapes or blinds to their advantage to create a pleasant ambience for potential purchasers. If you are considering an upgrade to the blinds in your home, whether for personal enjoyment, to add some new colour or texture to a room, or to increase buyer appeal leading up to a sale, there are some very professional and experienced blind companies operating in Melbourne who will provide free measure and quotes and offer styling advice too. Next time you are flicking through a Melbourne property website, or visiting an open-for-inspection anywhere in Victoria, take particular notice of the choice of blinds in each room, and then consider the overall impression of the property. The blinds could very well be the difference in making you like the property, or deciding that a property feels like home.